Jaysh Muhammad in Bilad al-Sham is a jihadi faction based in Aleppo province that was until July 2014 apparently part of Jabhat al-Nusra, which in that month issued a statement affirming no relationship with Jaysh Muhammad, which then put out a response saying there was never an allegiance to Jabhat al-Nusra. 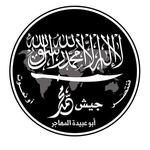 It is led by an Egyptian foreign fighter, Abu Obeida al-Masri/Muhajir, who founded the group after splitting from one Ahmed Obeid in the Azaz area of north Aleppo countryside at the end of 2012 both men adopted the name 'Jaysh Muhammad in Bilad al-Sham' for their own formations, though Ahmed Obeid eventually pledged formal allegiance to Jabhat al-Nusra in 2014. 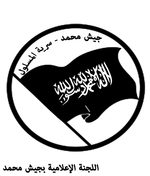 The main slogan of Abu Obeida's group, as related on its Twitter feed, is "the law of God rules us," referring to an ideological program of total implementation of Shari'a (Islamic law). This echoes the program of other foreign fighter battalions in Syria (e.g., the Uzbek Imam al-Bukhari Battalion, which also operates in Aleppo province). Whatever the truth of the relations between Jaysh Muhammad and Jabhat al-Nusra (and according to the foreign fighter on Twitter calling himself Abu Hamza al-Erhabi who claimed membership of the former in the Azaz area, Jaysh Muhammad was "sort of" Jabhat al-Nusra), there is in practice no ideological difference between the two. Abu Obeida's group eventually left the Azaz area in August 2014 at the request of the Islamic Front but the group still operates in Aleppo province even as Abu Obeida took up new residence in Latakia province. Abu Obeida al-Masri subsequently left Jaysh Muhammad, whose leadership decisions came to rest principally on a Shura Council. In June 2016, the group pledged allegiance to Jabhat al-Nusra, in keeping with its al-Qa'ida ideological affinities and fitting in with the wider trend of absorption of smaller al-Qa'ida-aligned groups by the official branch/affiliate.